Hedge funds are shorting the shares of listed UK dealers. 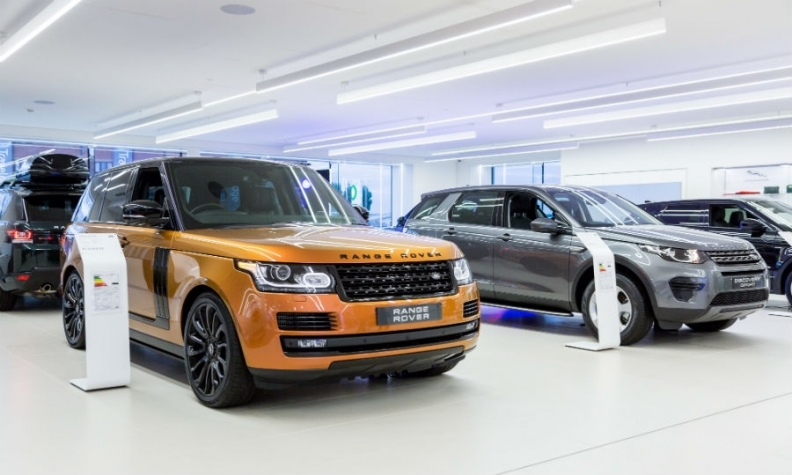 Pictured is a Lookers Jaguar Land Rover showroom in west London. LONDON -- Hedge funds are circling British car dealers, betting on their increasing vulnerability as a five-year sales boom slows in the face of waning consumer confidence and an accompanying drop in resale values. UK new-car sales registered the biggest annual drop since 2009 last year, data showed on Friday, with the Society of Motor Manufacturers and Traders (SMMT) predicting an even bigger decline this year. Fallout from Volkswagen Group's 2015 diesel scandal has taken a heavy toll, with UK demand for diesel cars tumbling by 17 percent last year on consumer fears over potential new charges, while post-Brexit uncertainties and lower resale values pose a risk to sales of both gasoline and diesel cars. Steep sales declines had already forced a profit warning from Pendragon dealer group in October, and rival Lookers said in November that its car manufacturer partners were reducing sales targets to ease pressure on the company. Shares in Pendragon, Lookers and listings website Autotrader, which has the car dealers as major clients, all ended 2017 down more than 10 percent, against a rise of 8.8 percent for the FTSE 350 index. Some investors are betting on even steeper declines, selling borrowed shares into the market in the hope of buying them back at a lower price and pocketing the difference, known as short-selling. Hedge funds including GLG and Wellington Management are shorting the shares of Lookers, Pendragon and Autotrader, according to filings with Britain's Financial Conduct Authority (FCA). Share prices of Pendragon, Lookers and fellow dealer Vertu Motors, were down by as much as 4 percent after Friday's release of the 2017 sales numbers. “There are concerns around Brexit and the general economic outlook,” said Randeep Grewal, a fund manager at hedge fund Trium Capital, who has taken short positions in the automotive sector. Analysts have cut their mean price targets on Pendragon's shares by 40 percent in the past three months, Reuters data shows, while price targets on Lookers and Vertu have fallen nearly 20 percent over the same period. Not all analysts take such a gloomy view of the dealers' prospects, however. Liberum's Adam Tomlinson, who covers UK motor retailers, recommends investors should buy shares in all three companies. "Most people have (already) factored declines this year into their numbers,” he said. But bets on further sharp falls are still growing. Short positions on Pendragon have nearly trebled since the end of November, according to the FCA. Another factor latched upon by the short-sellers is the threat to car finance packages that, thanks to a decade of cheap credit, now account for nearly 90 percent of new car purchases – nearly double the figure in 2006. Under one of the most popular financing options, known as “personal contract plans” (PCPs), customers pay a small deposit to lease a car, making lower monthly payments than under a traditional hire-purchase scheme, with the option to return the car at the end of the contract. The risk is that oversupply of used cars in the UK is about to hit the resale prices of cars on which PCP rates are partly based. PCP repayment rates would rise, further choking off demand for new vehicles and hitting dealer profit margins, which can already be as narrow as 2 percent. Lookers and Pendragon derive the vast majority of their profits from the UK and Ireland, making them more exposed to a British downturn than the more geographically diverse auto manufacturers. Pendragon is Europe's second-largest independent dealer group after Penske, according to Automotive News Europe's 2017 Guide to Europe’s Biggest Dealer Groups. Lookers is No. 3.